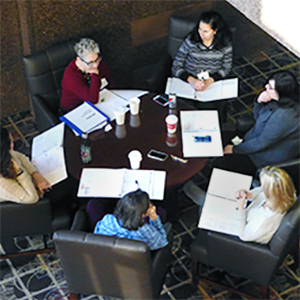 JECELI emphasizes the roles of reflective practice and mentoring in Judaism and translates these aspects into professional learning in Jewish early childhood education. Reflective practice therefore includes solidifying knowledge of child development, acquiring concepts of adult development, and considering theories of spiritual development. Each participant completes a self-assessment and implements a Leadership Project, as well as keeping an ongoing learning portfolio, with the help of a mentor. Mentors meet with individuals and small groups during sessions, and at very regular intervals during the year. Mentors are chosen for the program based on their experience in the field of Jewish early childhood education and on their abilities to model supportive guidance. Read more about Reflective Practice in a Jewish Social Context and our other areas of study.